Lululemon, Vail Resorts, and AutoZone stocks are likely to make big moves over the next few trading days. Stocks posted significant gains last week as the Dow Jones Industrial Average (DJINDICES:^DJI) passed 24,000 points for the first time. 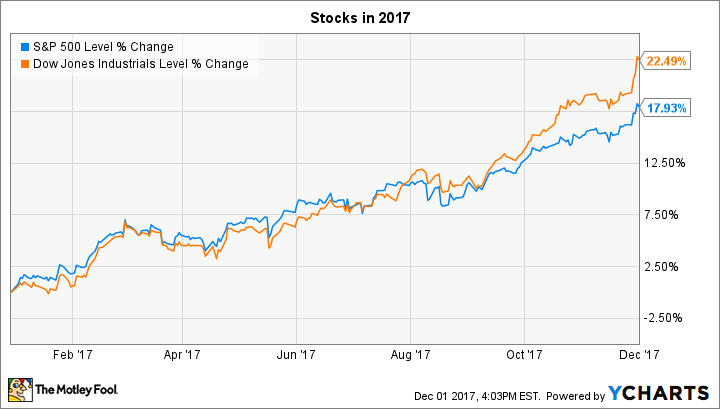 In fact, both the Dow and the S&P 500 (SNPINDEX:^GSPC) set new highs for the year, and pushed overall returns to approximately 20% heading into the final month of 2017. Investors will be looking for earnings reports to move individual stocks over the next few days, and some of the most anticipated are slated to come from Lululemon (NASDAQ:LULU), Vail Resorts (NYSE:MTN), and AutoZone (NYSE:AZO). Here are the trends to watch for in these announcements. Lululemon posts its quarterly results after the market closes on Wednesday, Dec. 6. The yoga-inspired athletic-apparel specialist might have good news for investors, considering it edged past management's forecast in its last report as revenue climbed 13%, to $581 million. Comparable-store sales growth made the difference, mainly thanks to healthy demand in the retailer's digital-sales channel. Profitability was solid, too, with gross margin improving by nearly 2 full percentage points, to reach 51% of sales. CEO Laurent Potdevin and his team responded to the brightening operating picture by hiking their full-year sales outlook in late August. They now see 2017 revenue rising to $2.6 billion at the high end of the guidance range, with the third quarter expected to bring in between $605 million and $615 million. Executives will have a much better idea of selling conditions heading into the holiday season, though, so any update to that forecast is likely to produce big swings in the stock this week. Vail Resorts announces its numbers on Thursday morning. The mountain-resort operator is coming off a solid fiscal 2017 that saw skier visits soar 20%, to 12 million, following the addition of the acquired Whistler Blackcomb property in Canada. That purchase helped offset a slight dip in its U.S. properties that management blamed on poor weather in Colorado. Vail has been targeting the summer months as a major opportunity to grow the business through non-ski attractions like hiking, sightseeing, mountain biking, and zip-line tours. Investors will learn this week whether those activities helped boost results for the typically slow fiscal first quarter. We'll also get an update on season-pass trends, which will determine whether management adjusts their earnings guidance this week. As it stands, Vail is expecting to generate between $256 million and $290 million of profit in fiscal 2018 compared to $210 million last year. Investors aren't expecting great news from auto-parts retailer AutoZone when it announces fiscal first-quarter results before the market opens on Tuesday, Dec. 5. Sure, the company enjoyed a sales-growth uptick last quarter, as comps improved to a 1% increase from a 0.8% decline in the prior quarter. However, AutoZone's expansion pace is still stuck close to zero and far below the 2% to 3% that shareholders routinely enjoyed in the three years ended in fiscal 2016. That sales slowdown has reduced the company's profit power, too, with net income rising just 6% over the past 12 months compared to double-digit gains in each of the prior five years. AutoZone management cited warmer winter conditions -- and not any new competitive threat -- as a key reason for the weaker comps last quarter. Thus, CEO Bill Rhodes and his team seem confident that they can keep growing in the new fiscal year. We'll find out on Tuesday if their efforts to improve the shopping experience are paying off by driving increased customer traffic.